I am back again with another review of Dan Brown's book, the widely famous, Digital Fortress. I told you I'm high on Dan Brown fever/craze!! 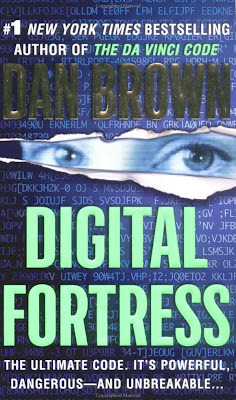 Digital Fortress, as the name promises, is a science fiction that will leave your mouth gaping as Brown's novels always do. It is another brilliant piece of work by the author. This time, the story is about NSA's (National Security Agency) top cryptographer, Susan Fletcher, who gets an urgent call from her boss on the weekend, Commander Strathmore, to come to work. She arrives to hear the shocking news that TRANSLTR, the NSA's incredible code-breaking machine which can even turn the best computer encryption software useless, has at long last come face to face with its enemy. Codenamed the Digital Fortress, it is an unbreakable code created by an ex-NSA cryptographer, Ensei Tankado, who had threatened to make it available for public use if the NSA didn't make TRANSLTR's existence known to the general public. This startling events inculcated terror through the veins of NSA. As Susan goes on a quest to find Ensei's secret partner, and relief to all of NSA's troubles, she is puzzled, angry and scared that Commander Strathmore has mysteriously sent her boyfriend David, an ordinary university professor, on a dangerous mission to Spain to retrieve this unbreakable code's key. Midwest Book Reviwers say it correctly, "Digital Fortress is the best and most realistic techno-thriller to reach the market in years. Dan Brown's ability to paint in living color the gray area between personal freedom vs. national security is awesome. The story line is so good, readers will feel a chilling thrill a minute as the book makes one think who is truly the terrorist and who is actually freedom's guardian." So, what else are you waiting for...grab a cup of coffee and the book from your nearest stores! Charles Dickens- Clothes Ripped Off!!! Charles Dickens has always been my evergreen favorite author for his brilliant works which one cannot resist. But it is not only today that we realize his worth and extol him, it has been so even in the past years. Dickens has been the most famous author who ever lived.....and the only one who had his clothes ripped off by fans!!! You can read more about the famous author on Wikipedia. It has been said that if there was ever a magazine for celebrities at that time, Dickens would certainly have featured on the front page of something called "Fashion from Boston"! He was certainly a very Mr. Popular. While in New York, Charles complained that he had multitude of followers as soon as he turned into the street. Nonetheless he enjoyed his celebrity status. But did you all know that Charles Dickens had his clothes ripped off by crazy book fans at that time. I'm sure he's even famous than any other celebrity of our time, having clothes ripped off! If this news has intrigued you and you posses any similar bizarre information about the author, I would be glad to hear it. Please do share you thoughts with me through your valuable comments! 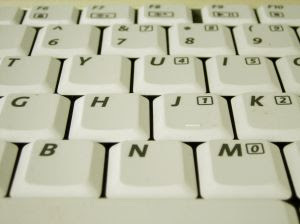 Seeing my writings at Delve Into The Mind Of A Budding Blogger, many readers have told me that complicated and unnecessary words dilute my message. After learning, I share with you all that any writer must try to avoid redundant words. Use short sentences and avoid complexity of your write-ups. This stands true, not only for writers but all bloggers, for readers mostly skim through your posts and not spend their eternity on them. Moreover, shunning exaggeration results in saving space, which can be put to better use. I am sure many may have advised you on this. But, as you know, you have to make sure at the same time that fewer words contribute to meaning and clarity. If you are in a difficult situation, I can understand as I am passing through such a phase now. And I tried to find how can I implement them. An extract from the blog clearly depicts it....for more, please click on the name of the blog and read this excellent post in detail. Eg:John was attacked by ruffians on the pathway. Ruffians attacked John on the pathway. Eg: Jim started to feel the pain when he became conscious. Jim felt the pain when he regained consciousness. Eg: Jennifer found her fiancé, whom she will soon marry. A sentence should always contain only necessary words, a paragraph and no unnecessary sentences. This article on Use Simple Words explains how to control the tendency to use complicated sentences. I give you below, an extract from the blog. To read more, please visit the blog. 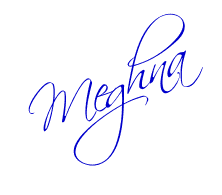 Write your texts with simplicity in mind. Once finished, read through the whole text and underline the words that you think some people might find complicated. Remember you are writing for a wide audience and not everybody has the same skills or knowledge to understand difficult words. I have done my job and it is now up to you to implement them. I hope you all benefit from this! Since my exams are over, I am now freely indulging myself into new books and have recently finished reading Dan Brown's prequel to The Da Vinci Code- Angels and Demons. And oh my! It certainly was an exhilarating read. I'm an avid Dan Brown fan now, after reading all four of his books. Though his books are controversial, I tell you....they are certainly worth a read. The science fiction is stupefying as usual and so is the mystery. 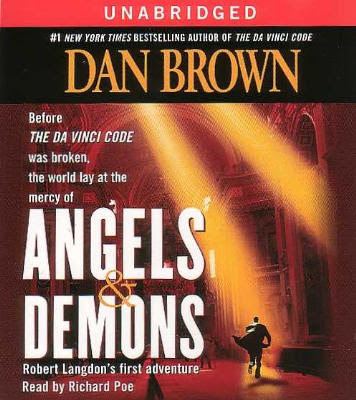 Angels And Demons is the first adventure of the Harvard Symbiologist (professor of religious iconology and art history at Harvard University), Robert Langdon. Robert, receives the most peculiar call in the middle of the night from Maximilian Kohler. Kohler is the director of CERN, the world's largest scientific research facility in Geneva, Switzerland. Langdon has a rapid trip to Geneva on his call which he hoped would be over soon....but one knows that a call from the director that too at the dead of the night cannot be just-so-usual! Reaching CERN's mesmerizing premises, he learns that one of their top physicists had been murdered, with his chest branded with the word "Illuminati." Since Langdon is an expert on the ancient secret society known as the Illuminati, he's asked to help solve the murder. And as the mystery unfold, with unexpected twists and turns, it takes you on the most exciting and blood curdling tour of the modern world. All packed with loads of action with the antimatter bomb and a lady like Vittoria Vetra, with the Vatican City at stake....there's not time to loose as Langdon and Vetra get head deep into the search of the old unforgettable Satanist cult, Illuminati and unveil an astounding story! The four cardinals,(the most worthy predecessors of the Pope whose recent death brought forth the conclave to choose a new pope), are kidnapped and missing. The Illuminati phones and tells them that they have four hours until midnight before the antimatter explodes and destroys the City and each cardinal would be branded and killed in the four sacred Illuminati churches and branded with the Illuminati symbols on their chest. The fate of the Vatican, the cardinals and CERN....all lies in the hands of the two, Robert Langdon and Vittoria Vetra. Will they be able to save the place in time? Will they succeed?? I tell you guys....you should read the book. This is one of the best thrillers I have read, where scientific matters are explained in such a way that even laymen can understand. As Dale Brown says, ANGELS & DEMONS IS ONE HELL OF A BOOK. A not- to -miss suspense and watch your heart beat grow crazier with every page turned. But that is what I have found. What about you? While browsing through the net to provide my readers with something interesting, one of the posts on Writers Digest caught my attention. Writers Digest as it's description says- Write Better Get Published, is a wonderful writing site that will interest every amateur and budding writer. Along with giving valuable tips to young writers to help them enhance their writing, it also gives professionals an opportunity to help them get published. One of the posts, Sub-Genre Descriptions is really very interesting, so I thought I'd share an extract of it with you too. The Horror section particularly interested me. "Horror fiction is, broadly, fiction in any medium intended to scare, unsettle, or horrify the audience. Historically, the cause of the "horror" experience has often been the intrusion of a supernatural element into everyday human experience." according to the Wikipedia. Thus today, I share with you the definitions/descriptions of some commonly used terms in the genre of horror fiction. "Horror, for me, is the compelling don't want to look/must look' sense of awe we feel under the breastbone." Dark Mystery/Noir:inspired by hardboiled detective tales, set in an urban underworld of crime and moral ambiguity. Gothic:a traditional form depicting the encroachment of the Middle Ages upon the 18th century Enlightenment, filled with images of decay and ruin, and episodes of imprisonment and persecution. Hauntings:a classic form centering on possession by ghosts, demons or poltergeists, particularly of some sort of structure. Magical Realism:a genre inspired by Latin-American authors, in which extraordinary forces or creatures pop into otherwise normal, real-life settings. Science-Fiction Horror:SF with a darker, more violent twist, often revolving around alien invasions, mad scientists, or experiments gone wrong. Weird Tales:inspired by the magazine of the same name, a more traditional form featuring strange and uncanny events (Twilight Zone). If you enjoyed this extract, pay a visit to the site, Writers Digest, to read more of these Sub-Genres and I'm certain you'll enjoy them!